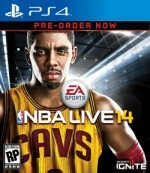 After a three-year absence including two aborted games, EA Sports is finally stepping back onto the hardcourt with NBA Live 14. Over the course of its struggles, EA continued to express its unwavering commitment to the NBA, promising a return to the glory years where Live was a formidable sports franchise. Perhaps that dedication was misguided, because even if it's viewed as a first step in a multi-year rebuilding project, NBA Live 14 is in rough shape. From the unintelligent commentary and overenthusiastic crowd to the inferior player models and awkward movements that lack transitional animations, NBA Live 14 feels like a game in arrested development. The basketball on display bears more resemblance to a YMCA pickup game than the best league in the world. Players stand around on offense waiting for something to happen instead of ad-libbing with dynamic decision-making. When you do call plays, you have no idea what's supposed to happen unless you memorize the play in the coaching menu. Limbs and balls clip through player bodies consistently. NBA Live 14's signature gameplay enhancement, the BounceTek dribbling system, doesn't feel dramatically different from other basketball games I've played. It takes a while to get the hang of jump shooting; EA clearly had trouble with it too, because I saw several players shoot with their backs to the basket. But since help defense is largely an afterthought, you can consistently score by driving the lane, taking a Eurostep, and shooting a layup whether you are playing the CPU or another person online. The game modes are in similar sorry shape. Dynasty operates like it has been designed by former Timberwolves GM David Kahn, brought down by terrible trade logic, imbalanced rosters, and a league-wide salary cap mess due to inflated contract extensions for middling players. The Thunder traded arguably the second-best player in the NBA, Kevin Durant, to the Nets for point guard Deron Williams, even though the team already had all-star Russell Westbrook manning the position. The simulation logic is equally flawed. In one season, the Atlanta Hawks won the NBA championship with a questionable roster led by perennially injured guard Martell Webster, who was the team's leading scorer. The EA Sports equivalent to MyCareer, Rising Star, should be renamed First Round Bust. It follows the same trajectory as the 2K mode, starting at a draft showcase and leading into your first year as an NBA player, but your progress is communicated in boring menu boxes instead of cutscenes, and the punitive rating system is a constant source of frustration. Your performance rating is knocked for every little transgression – failing a steal attempt, missing shots (even if your shot selection was good), or allowing your "matchup" to score even if you rotated to defend another player a long time ago. Other play options include Live Season events that allow you to relive big moments from the current season every day, Ultimate Team, and head-to-head online seasons. Each of these is competent, but ultimately undermined by the lackluster action on the court. I've always argued that competition breeds innovation in sports games, so I am rooting for EA Sports to succeed in resurrecting its basketball franchise. But the vast gulf in quality between NBA 2K and NBA Live right now makes this a tough matchup to watch. Like an old player attempting a comeback after multiple knee reconstructions and several years away from the game, NBA Live 14 doesn't have enough skill or composure to keep up with the competition. enough skill or composure to keep up with the competition.